The eleventh installment in Patrick O Brian s excellent series of naval adventures finds Aubrey and Maturin back in Britain as their journey to the Pacific, begun in the previous book, comes to a conclusion. Aubrey, always a minnow among land sharks when he has money in his pocket, finds himself innocently ensnared in a complicated stock exchange scam that may have been set up by Maturin s enemies in the intelligence game. The complex case and courtroom scene, O Brian assures us in a note, are based on a real case. The pillory scene is powerful, as Bonden gruffly clears the square of all but sailors, and officers and seamen of all stripes come to show Jack their love and respect. 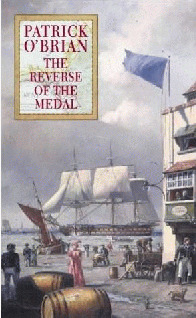 After several books at sea, «The Reverse of the Medal» brings readers back to the Admiralty in London with its complicated and layered intrigues, back to Ashgrove and Sophie, and back to Maturin s espionage machinations. As always, O Brian s wonderfully intelligent prose and satisfying grasp of historical nuance captures the reader in little pockets of 18th-century Britain.